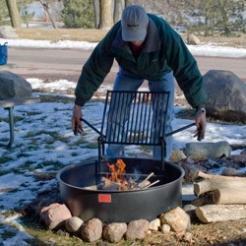 Campfire Cooksite - 30" Dia. 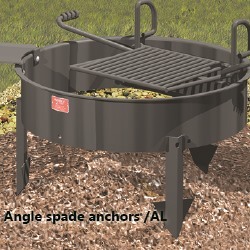 Campfire rings with the Angle Spade Anchors (AL) CANNOT SHIP UPS and will need to ship LTL Freight. Please request a quote for LTL rate. The FA Series Campfire Rings combine our original Infinitely Adjustable cooking grate with our flanged fire ring – a practical design combination for campfire control and convenient outdoor cooking. The 270 sq. inch cooking grate is Infinitely Adjustable vertically from below the top of the fire ring to 7-3/4" higher. This cantilevered grate is structurally reinforced to resist hard use and vandalism. 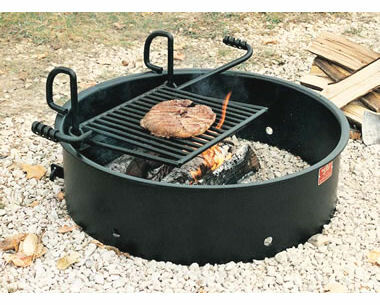 The cooking grate can be lifted over and out of the campfire ring, but remains permanently attached. 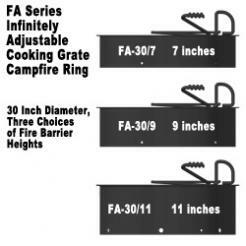 The FA-30 features a 30” inside diameter and four optional side heights of 7-3/8”, 9” and 11-3/8”. Plus a taller firering Model FA-30/18/PAthat is 16-7/8" tall. The different side heights affect the size of fire that can be built. FA Series fire rings (7", 9" and 11" tall) include tip back anchor pins (/TB) to keep the campfire ring secured in one place, but allow the fire ring to tip up for easy clean out. These pins must be set in concrete. Cooking grate adjustment handles, made from 3/4" dia. 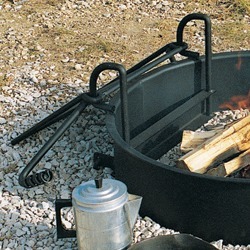 steel, are turned outside of the fire ring, away from the fire. 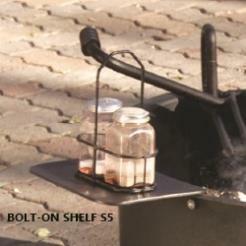 The handle grips are 1/8" x 1/2" coiled steel bar. 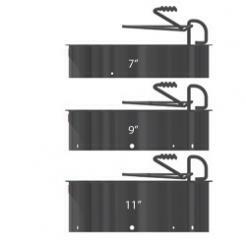 The cooking grate is built using 5/8" dia. steel perimeter bars and 1/2" dia. 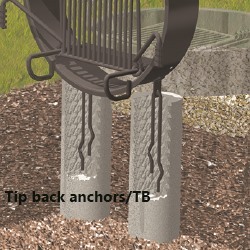 steel grate bars. 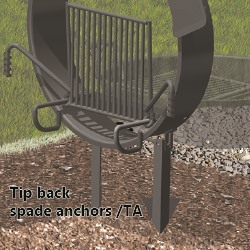 All grate bars are welded on both sides. Angle Spade Anchors (/AL) are 3 spades attached around the firering and buried in the ground. The firering cannot be tipped up.